I know you haven't heard any mention of veggies around here since I first plucked a handful of crunchy snap beans. Never fear, though, the Bauer Family Garden is going strong and (dare I say) producing better harvests than ever in its third year. The combination of a busy summer plus no camera has kept me from documenting, but it has not kept me out of the dirt. Once the ground dries, I'll post a peek into what the backyard looks like, but for now, feast your eyes on the red beauties that line my windowsill. 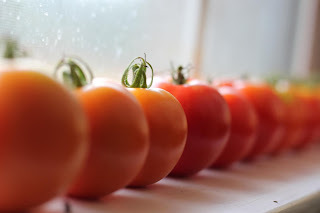 I think the first tomato broke color as June became July and they haven't stopped coming. Only two of my varieties have been harvested, but so far - delicious! We've also eaten about 20 cucumbers and I'm impressed. I had my fingers crossed as the first one was twisted off the vine. I had reason to be nervous after last year's season-long bitter cucumber issue. It seems this year's variety gets two thumbs up! We've enjoyed one Anaheim pepper in quesadillas and we've served a couple rounds of fresh beans sauteed with onion and garlic. It's been a delicious summer thanks to the kitchen garden, and we've only just begun. Once the plants stop rejoicing in the long-lost rain, I'll get out there for an official tour. Trust me, it looks a little different these days. Until then, Happy Monday!